Nago Pine Garden Co., Ltd.
1195 Biimata, Nago City, Okinawa Prefecture. 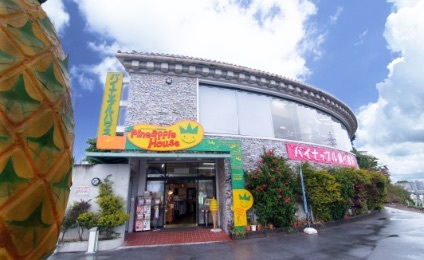 Nago Pine Co., Ltd. (Nago Pineapple Park) was established. Nichinan Bussan Co., Ltd. was established. 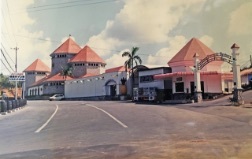 Nago Pineapple Winery Co., Ltd. was established. Okinawa old folk house “Ufuya” was opened. 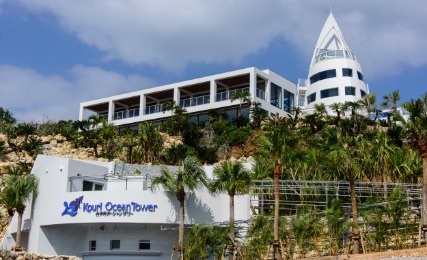 Kouri Ocean Tower was opened. 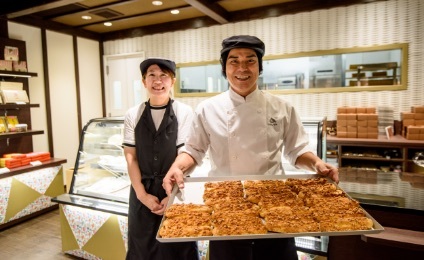 ​ ​Pineapple Park branch was opened at Naha Airport International Terminal. 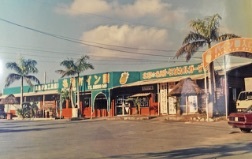 In 1979, at the time of its establishment, it used to be a small shop only selling the local pineapples from Okinawa Prefecture. You can feel the flow of time from this picture. 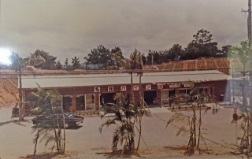 In 1985, after 6 years from the establishment, we started selling not only pineapples but also a variety of tropical fruits from Okinawa Prefecture. The exterior incorporates the Ryukyu Hanagasa (hat adorned with flowers) as well. Two years later in 1987, we started to sell different kinds of original sweets made from pineapple. 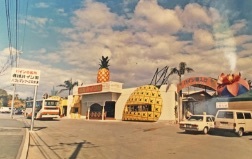 It is said that our symbol "Big Pineapple" was also created around this time. The Asatoya house built in 1901 at current Nakayama Ward, Nago City was restored in 2001. 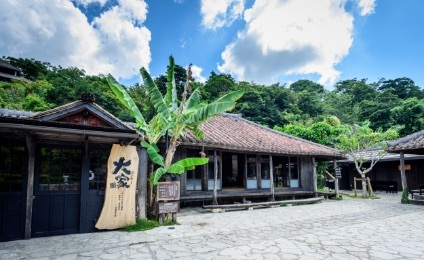 Sawazuya · Shinshiro were then relocated and restored, and now here is where you can enjoy some Okinawa soba during lunch time, and a variety of Okinawan cuisine such as Agu dishes during dinner time; all amidst a good old atmosphere. The Grand Opening was held on 23rd November 2013. A new attraction was founded in Kouri-jima; island of love! On to the automatic cart and go through the garden and under the waterfall to reach the observation tower. 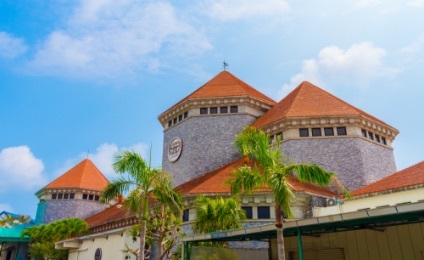 The shell exhibition hall which displays over 10,000 shells from around the world is overwhelming. The pumpkin sweets only available at Kouri-jima are one of the popular delights! Enjoy the authentic Pizza Napoletana in the restaurant with the best view in Okinawa. In 1992, Nago Pineapple Winery was established for the first time in Japan as the first of its kind to use "pineapples" as an ingredient. With strict quality control, we manufacture new wines and juices which brings the best out of different pineapples such as pineapples with rich fragrance, pineapples with delicate sourness, and fully riped pineapples with exquisite sweetness. 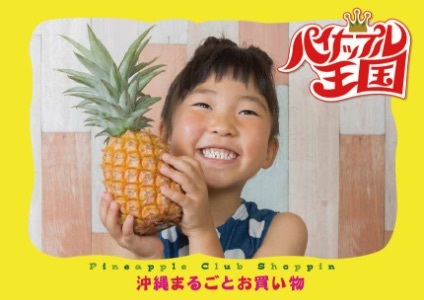 We specialize in Okinawa special products including pineapple products, carefully select fruits and agouties directly from farmers and ship nationwide. Souvenirs are arranging before the trip, and people who apply for traveling to Okinawa by hand and reaching the day they come home are also increasing. With this motto in our mind, we make original sweets made from local pineapples of Okinawa. The famous "Original pineapple castella with real fruit" has been manufactured since 1985, and still has its delicious taste remaining utill now.